So… I’ve been a pretty rubbish blogger as of late. That’s not to say I haven’t baked, or cooked, plenty of things, things that I had planned to post about. But the actual posting just never happened. Some of the things I baked deserve to be shared though, I think, even if I made them over a month ago. 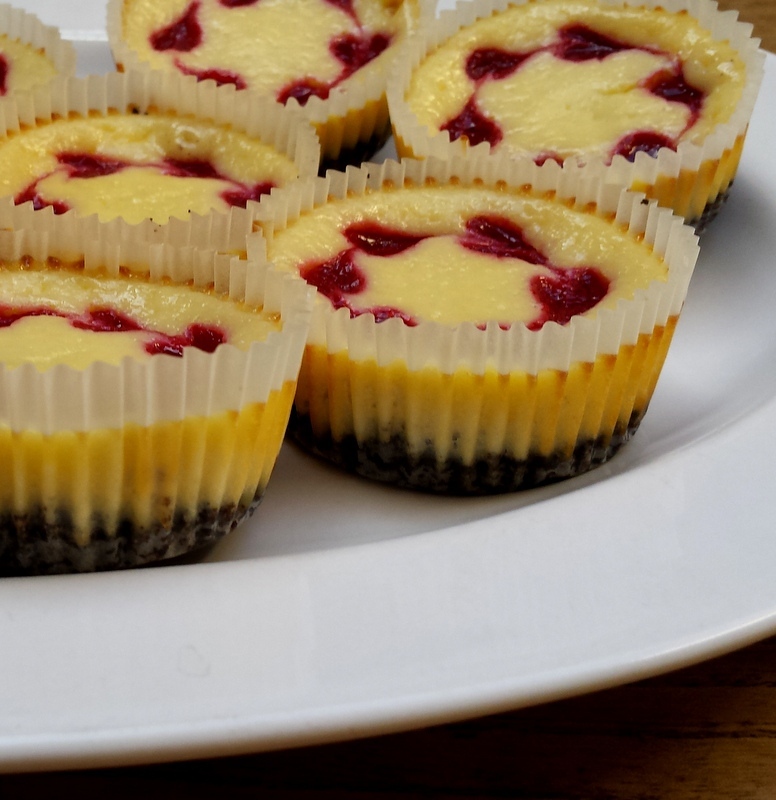 Like these mini raspberry swirl cheesecakes. With Oreo crust. They were just too pretty not to be blogged about. And yummy! And easy! And I don’t even really like cheesecake. I think I’ve mentioned that. My friend Julia does, however, and since it was her birthday one Saturday, I decided to Google cheesecake recipes. And then I thought, maybe something “raspberry-y”, to hide the nasty taste of cheesecake. And then I thought, maybe an Oreo crust, to conceal it even more. And the result is a tiny bite of cheesecake that even I can enjoy! Heavy on the Oreo, heavy on the raspberry coulis, and somehow not heavy at all. Very moreish in fact (well, if you like that sort of thing). It was a little bit stressful bringing a cake to a party when I hadn’t been able to fully taste-test it (I mean, it tastes perfectly ok to me, tangy and sweet and Oreo-y, but I’m not exactly a cheesecake expert/aficionado…).. But after substantial feedback, I think I can confidently say that this recipe is a keeper, and super easy to boot! Two colleagues even said this was the best thing they’d ever eaten, when I brought a batch to work the following Monday. So I think I’ll be making these again, and I think you should, too. i.e. 1 1/2 cups, and used 1/2 Tbsp for each cupcake liner, instead of a full Tbsp, I found that the amount of crust only allowed for 18 mini cheesecakes, not 34. So I had a LOT of cheesecake filling left over 🙂 But I put it in the fridge, bashed up another 1 1/3 packs of Oreos the next day, added 80 g (5 1/3 Tbsp) of melted butter, and made 24 more mini cheesecakes, which I then brought to work on Monday. 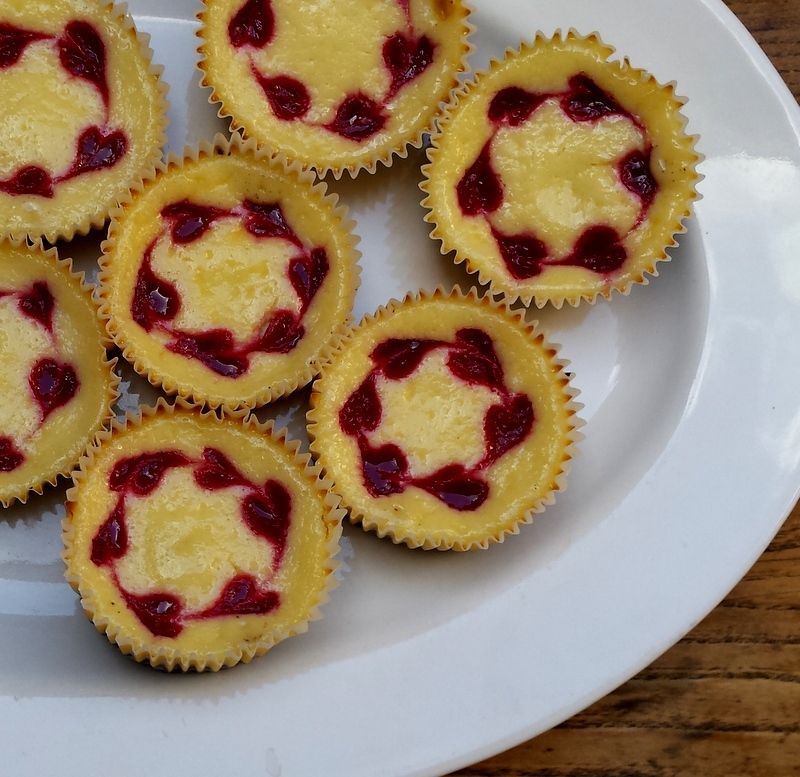 In case you think making 42 mini cheesecakes is a bit overkill, I’ve put the amounts for both 18 and 42 respectively, down below 🙂 the one for 18 first, and the one for 42 at the end of the page (although I highly recommend making 42 😉 ). If you make the 18 variation, you will still have a tiny bit of the filling left over. either use store bought raspberry coulis, like I did, or make the one from the original recipe! 🙂 I was perfectly happy using store bought, since it’s made up of just raspberries and sugar anyways, and can be purchased form the frozen foods isle/doesn’t contain any additives. 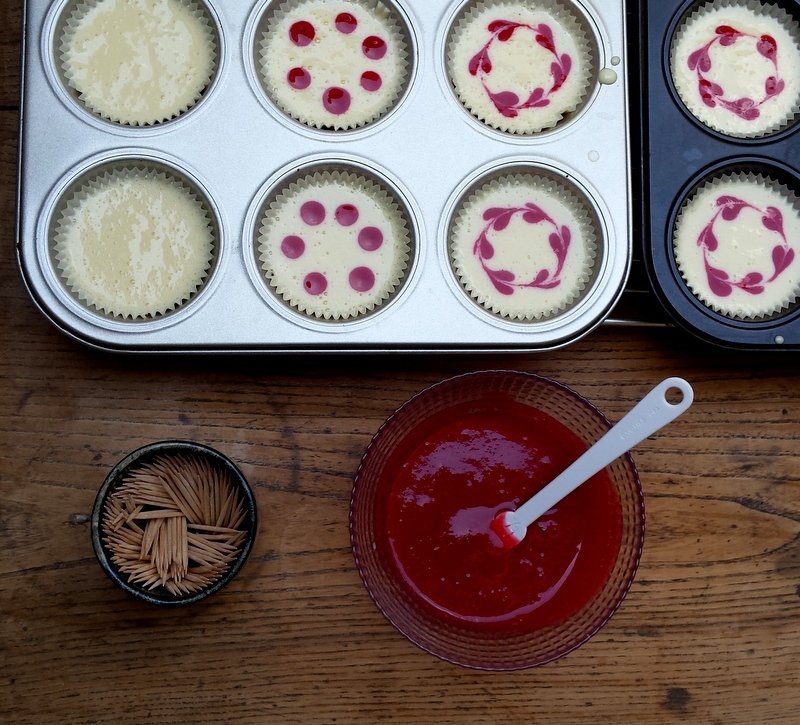 I used a 50 g packet, and it was more than enough for either the 18 or 42 mini cheesecakes. Preheat your oven to 160°C/325°F. 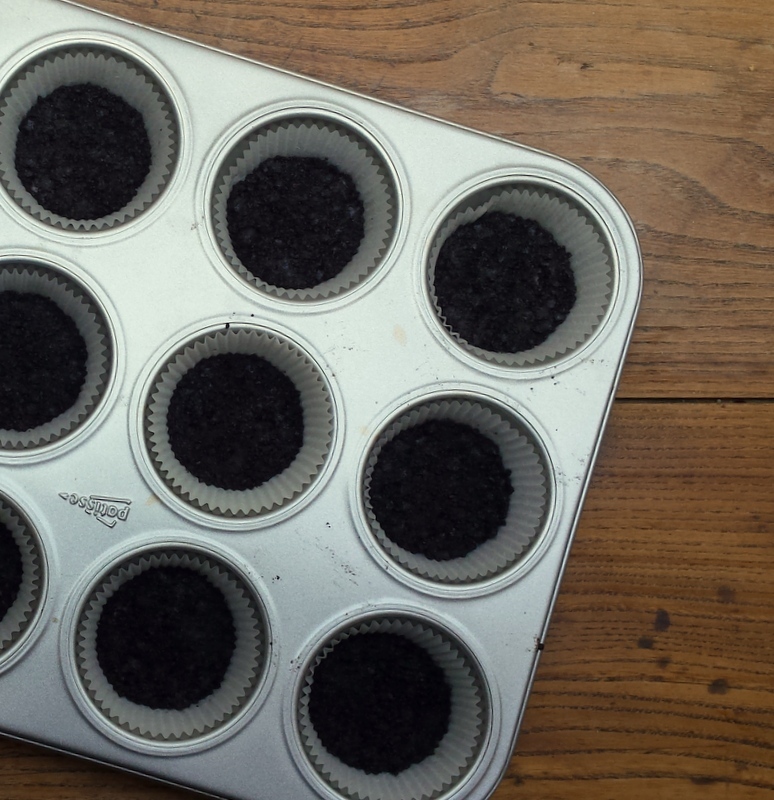 Line 18 holes in your cupcake tins. Place your Oreo cookies in a sturdy freezer plastic bag, preferable one that can be sealed at the top (otherwise just twist the top and hold on to that end), and proceed to bash the living daylights out of it with a rolling pin. This is very therapeutic. When there are no big chunks left, and the cookies look like black sand and teeny tiny rubble, pour them into a small bowl, and add the melted butter, mixing well. Put about 1/2 Tbsp of the crumb mixture into each cupcake liner, and push it down with the back of a teaspoon, to form a tight and uniform layer. Bake for 5 minutes (although I forgot mine in the oven for 8, and they were fine). If you’ve remembered to take your cream cheese out of the fridge a couple of hours in advance, awesome. High five to you. If you haven’t, place the cream cheese in a bowl, and microwave on high for about 10-15 seconds at a time, stirring well after each time, until the cream cheese has come to room temperature and is soft and easy to mix with a fork. Beat the room temperature cream cheese with an electric beater until fluffy. Mix in the sugar, beating until smooth. Add the salt and vanilla, and then the eggs, one at a time, beating well after each egg. With an ice cream scoop, scoop the filling into the cupcake liners, filling them about two thirds. Bake for about 20-22 minutes, until the filling is set, rotating the pans halfway through baking. The cheesecakes will puff up a bit, but won’t stay puffy once cooled. Place the baking tins on a wire rack and let cool to room temperature, then place in the fridge for at least 4 hours, before serving. Raspberry topping: store-bought or home-made raspberry coulis. ← Gin & Tonic Drizzle Cake!